In my blog you will find some amazing posts about types of guns, holsters and some tips and tricks related to the same. So, keep on reading! Also you can visit my website for more info. Few people have enjoyed a cop movie or a military drama without seeing likely a few shoulder holsters adorning the torsos of those on the silver screen. 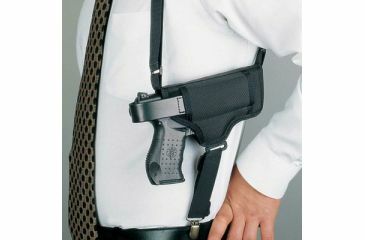 While perhaps not for everyone, a shoulder holster can be practical for everyday use in certain situations. Like all holsters, it comes down to the features and specifications that are most important to the user, and even those that aren’t planning on starring in the next Hollywood hit may find shoulder holsters a valid option. Shoulder holsters provide one of the quickest options for weapons access. With a little practice and a good fit, impressive draw times can be achieved. They’re also very comfortable, and depending on the size of the gun that is being carried, they can help eliminate the risk of sagging pants from a weighty weapon. Many shoulder holsters feature a horizontal position which means that they are constantly staring others head on. For everyday wear, muzzle sweeping your friends and colleagues may not be the best option. They’re also a bit more challenging to use from a sitting position, however they are actually easier to use while sitting than a hip holster or a pocket holster, both of which are near impossible to use practically while sitting. Shoulder rigs are considered concealed carry holsters, however a bit of effort needs to be employed in order to actually conceal them. A jacket or light coat is almost always required. There is simply no way to use a shoulder holster without some sort of exterior clothing over your every day wear. If required to remove a jacket or coat, the firearm then is in plain sight, making it a poor choice for summertime outdoor activities and other situations where a jacket is not practical. It’s a good idea to browse shoulder holster reviews to see which ones provide the best level of concealment and the least amount of printing. While not always practical, shoulder holsters can be ideal for comfortably carrying heavier weapons and improving the speed of your draw. There are both safety and practicality concerns involved, and this is true with any holster. Your specific needs and situation will help determine if a torso based rig is ideal for you.